From the stylish Bridgeport collection, this bold timepiece is ideal for his day to night style. Crafted in a sumptuous blend of stainless steel sophisticated finish, offset by a black dial and black leather strap for a fresh finish, this beautiful watch is the perfect accessory for the modern professional man. 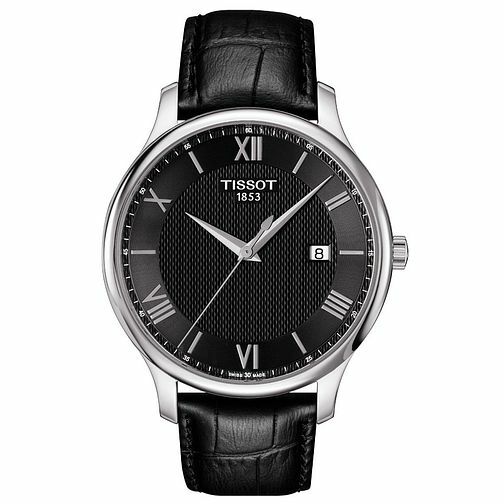 Tissot Men's Stainless Steel Black Strap Watch is rated 3.0 out of 5 by 1. Rated 3 out of 5 by Anonymous from Difficult to use strap Watch is very nice but the strap is very stiff and difficult to put on and remove, a simple buckle strap would have been better than the complex strap Tissot have put on this watch.